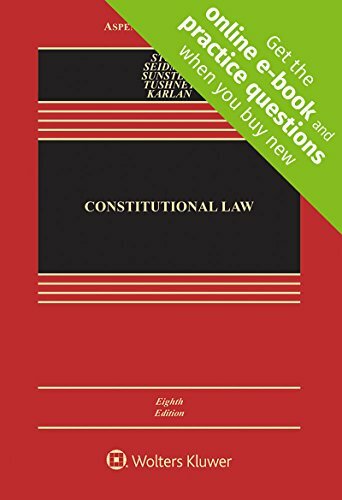 Adhering to the multi-disciplinary and scholarly approach of its predecessors, the eighth edition of Constitutional Law guides students through all facets of constitutional law. Constitutional Law explores traditional constitutional doctrine through the lens of varying critical and social perspectives informed by political theory, philosophy, sociology, ethics, history, and economics. This comprehensive approach paired with carefully edited cases provides instructors with rich material for classroom discussion. Logically organized for a two-semester course, the first part of Constitutional Law tackles issues concerning separation of powers and federalism while the second part addresses all facets of individual rights and liberties. Constitutional Law also provides thoughtfully selected content on the First Amendmentto give students a well-rounded understanding of religion and free speech issues.